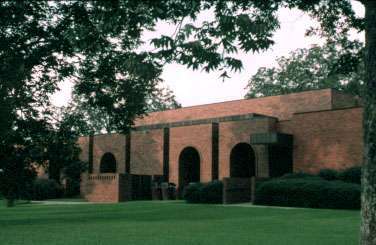 The modern courthouse you see in Colquitt today is the county's fourth, the first three having been destroyed by fires in 1873, 1904, and 1974. Designed by Tomlin Associates of Atlanta using traditional design elements in a contemporary way, it stands among venerable shade trees in the center of the town square. "Though the courthouse itself was an office building for county officials and a place for holding court, the upstairs assembly room was often used for many things besides trials - a sort of community hall. There was, for instance, one of the last Old Soldiers' Reunions ever held in South Georgia. There were county-wide school competition meets. Children...congregating on the square and marching up to the courtroom for contests in spelling, recitations, and singing. There were Chatauquas, Fourth of July celebrations...and at least one attempt... to organize Community Singing on Sunday afternoons." The building burned in 1974, possibly as a result of faulty wiring. and go one block to the town square.